My research focuses on the study of ‘soft matter’, materials such as liquid crystals, polymers, or colloids, which have properties somewhere between those of solids and liquids. Due to their combination of fluidity and order such systems possess a range of fascinating properties and have applications in areas ranging from the mundane, such as food technology and personal care products, to cutting edge areas, such as displays or organic electronics. I am particularly interested in interfaces involving soft materials. In these environments the fluidity and order of these materials becomes more apparent, and when the two materials in contact have different properties a range of fascinating and potentially useful phenomena can arise. To study these I use computational modeling, primarily molecular dynamics simulations to investigate the structure of these systems on a molecular level. As is familiar to anyone who has washed dishes the adsorption of molecules at the interface between two immiscible liquids is a useful and ubiquitous phenomena. As well as surfactants, more complex species such as nanoparticles, polymers, or proteins may adsorb onto interfaces, which can be used in applications such as nanostructure formation, catalysis, or in the creation of thin films for electronics or photonics. The use of solid particles to stabilize emulsions (so-called Pickering emulsions) dates back over a century to the work of Ramsden and Pickering. Due to their nanometre size proteins may be used as emulsion stabilizers. Compared to using particles or surfactants as emulsion stabilizers proteins have the advantages that they are monodisperse, biocompatible and relatively inexpensive, that will allow their use in applications such as food technology. This project aims to explore the suitability of proteins as Pickering emulsifiers. In particular it will attempt to correlate the adsorption strength of a number of commonly studied proteins with their efficiency at stabilizing emulsions. 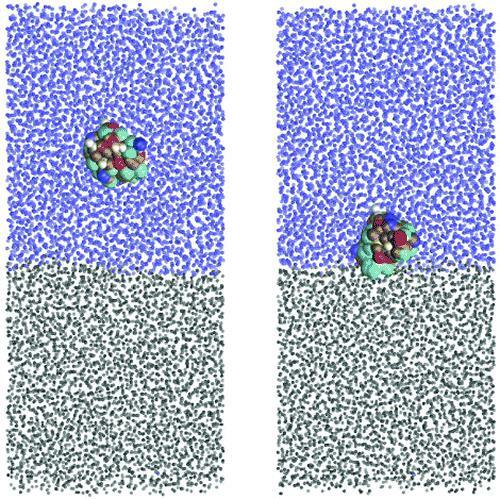 Using umbrella sampling simulations the free energy of adsorption of proteins (e.g. BSA, β-lactoglobulin, HFBII) that have investigated as emulsion stabilizers have been calculated. By employing a simple coarse-grain model this allowed the rapid characterization of the adsorption free energies in these systems. For more information about the project contact Dr David Cheung (david.cheung [at] strath [dot] ac [dot] uk), Lecturer at the Department of Pure and Applied Chemistry at the University of Strathclyde.